Movement in water and air was Leonardo’s greatest preoccupation. As the most tangible evidence of natural force, spiraling forms and vortices held a particular fascination. Their forms pervade the entire spectrum of Leonardo’s work in the realms of hydraulics, anatomy, mechanics and art. The framework for Leonardo’s understanding of the vortex was drawn from late medieval natural philosophy, derived originally from classical sources. 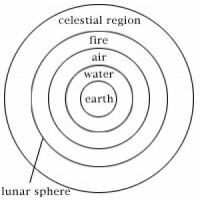 The four elements – earth, water, air and fire were arranged in concentric circles. Each desired to find its own level in nature. An “accidental force” was required to move one of them from its assigned position. An object above its natural level would exercise weight and desire to descend according to the rule of gravity. One below its natural level, such as a submerged bubble, would desire to ascend by the shortest route possible. In late medieval theory, the quality impressed in a moving body by force was termed “impetus”. The concept of impetus differed from the Newtonian law of the conservation of motion in that impetus “drains” from an object in accordance with the natural rule of the pyramidal diminution of power, rather than persisting until opposed by contrary forces. Nonetheless, impetus was just as remorseless as Newtonian inertia. On encountering an obstruction, a moving object would necessarily strive to complete its assigned motion, creating patterns of eddies or vortices in the process. As a “Master of water”, Leonardo needed to manage the movement of water and control its destructive, erosive power. He studied and recorded the movements of water under variable conditions repeatedly, adopting a scientific approach to the subject, as illustrated on Ms F Fol18v. In the second diagram, water cascades from the gate of a lock, falling into other water. That which is closest to the middle is “most oblique” and that which is closest to the extremities “most upright”. Leonardo’s study of water became particularly intense around 1508, coinciding with one of the periods of study of human anatomy. The human body provided the perfect model for the engineer and vice versa. 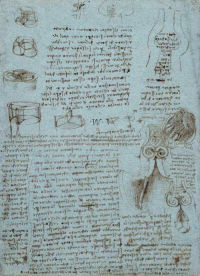 Leonardo’s study of the aortic valve, as illustrated in his drawing Notes on the valves of the heart and flow of blood within it, was unprecedented. Once again, the approach is highly scientific. He studied the problem just as he did the flow of water, by making models of the aorta, giving instructions for making wax casts and glass models. He noted experiments with flowing water and grass seed to track the flow of blood through the valves. Leonardo’s studies of the shape of the valve cusps showed him that the orifice of the open valve was triangular in shape. By applying his hydrodynamic studies to the effects of such a shape on the flow of water from a pipe, he noted that whether horizontal or vertical, the flow was greatest at the centre where there was least friction with the sides. The shape of the outflow through the triangular orifice made three distinct eddies returning back as they percuss the stationary blood already in the aorta, as illustrated in the lower diagrams on the Notes on the valves of the heart. The weight of the returning eddies then caused the valve to close, ready for the next surge of blood. Leonardo came to realize that the essence of cardiac action was its contraction in systole whereby its contained blood was “percussed” and expelled along the arteries. The central, most powerful part of the bloodstream ejected through the aortic pressure valve produces the pressure wave through the aorta and other arteries, which Leonardo recognised as the palpable pulse. The age-old dream of perpetual motion, in which an object moves forever without the expenditure of any limited internal or external source of energy, became a fashionable quest for Renaissance inventors. 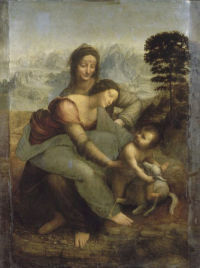 In the Codex Madrid, Leonardo recalled “having seen many men and from various countries brought by their infantile credulity to Venice with the great hope of gain by making mills in dead water. Being unable, after much expense, to move such a machine, they were compelled by great fury to escape from this debacle”. Carefully drawn “wheels which continually revolve” in the Codex Forster may well be the designs of others encountered in Venice. 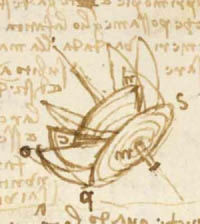 Commenting on the failure of each device, Leonardo noted that such wheels are “sophistical”. Later he exclaimed “speculators on perpetual motion, how many vain designs you have created in the like quest! Go and join up with the seekers of gold”. And yet, he was unable to resist the challenge himself! In the belief that spirals and screws might hold a solution, he applied his beloved principle of the vortex to the problem. The design on the right of Codex Forster Fol 44r is one of a number of solutions or “compound screws” involving planar spirals, conical spirals and V-shaped configurations of tubes combined to achieve continuous motion. The water ascends to the centre of the planar spiral “s p” and then passes to the pyramidal screw “n c” running from the point at “c” to “p” and acting as an “equidistant lever” to turn the whole apparatus. As the device revolves, further “levers” would come into play, though the precise configuration or operation is far from clear. Ultimately, the quest for perpetual motion eluded Leonardo, just as it eludes modern physicists today. Leonardo famously said that mechanics is the “paradise of mathematics”. Today, few might agree with him in light of the complexities of the subject! 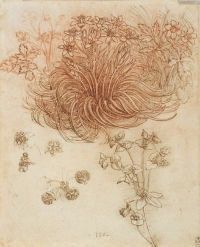 In accordance with Aristotle’s concept of science as a systematic inventory of the world, he set out to classify vortices just as a botanist might classify plants. Ultimately the task defeated him. In the late Deluge Drawing this prophetic vision of the destructive powers of nature is given full visual expression. The turbulent forces that condition man’s existence take the form of swirling vortices of air and water which have now become synonymous with the uncontrollable and unknowable forces of nature in Leonardo’s mind.